The ACO KlassikDrain is an extremely popular trench drain system, given that it works well for a variety of applications. 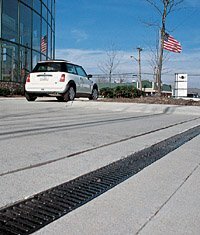 This ACO commercial trench drain is also easy to customize, since it comes with a variety of grate types. If you�re interested in the ACO KlassikDrain, contact DuMoore Systems today. If you�re not sure if the ACO KlassikDrain will work for your project, reach out to the experts at DuMoore Systems for an experienced opinion. ACO KlassikDrain systems are manufactured from polyester polymer concrete, which is strong and long-lasting but still lightweight. You can also choose between a galvanized or stainless steel wearing edge rail, depending on your needs. These trench drains come with many grate options � you can choose your material, load rating, and slot configuration. All the grates come with the QuickLok, a patented locking system that doesn�t require bolts. With QuickLok, you can fit and remove the grates quickly, which reduces your installation and maintenance costs. Every system has 130 feet (40 meters) of continuous slope. The wall thickness is at least 1/2 inch (13 mm), and the edge rail is at least 1/8 of an inch (3 mm) thick. If you�re interested in these ACO commercial trench drains, reach out to DuMoore Systems today. We�ve provided specialty trench drains since 1984, and we�re confident we can help you find the product that best meets your needs. To place an order or speak with a member of our team, call (800) 277-5015. Sloped (0.6%) channel units - meter long units provide 98'-5" continuous slope. Neutral units can be used to extend run lengths. Integrally cast-in galvanized steel edge rail provides additional strength and protects channel body from damage. (Stainless steel edge rail also available - KS100S). Profiled side walls - strengthening pillars and frost keys provide channel body strength and mechanical keying to surrounding concrete. Direction arrows on the sides of the channel indicate flow direction and ensure channels are installed correctly. Bottom drill-outs are included on all channel units to allow vertical evacuation of the system along the run. Schedule 40 drill outs are sized for 4" and 6" pipes. Note: for 6" pipes, an oval to round adaptor is required (Part No. 95140). Interconnecting end profiles allow easy and effective joining of channels. Appropriate sealant can be used to create a sealed joint. 4" internal width trench system - meter (39.37") and half meter (19.69") channel. 'U' shaped bottom improves flow hydraulics. Call 800-277-5015 to place your order for KlassikDrain!